This document updates the Draft Guidelines for Outreach Meetings document that was approved by the Steering Committee in April 2012. It incorporates specific requirements based on lessons learned and feedback received from the PLS subcommittee and meeting participants. The OGP Global Summit and Regional Meetings are high-energy, inspirational, and action-forcing events designed to maintain high-level political engagement, facilitate peer learning across countries, and foster dialogue between government and civil society participants. The following are requirements for the host government to organize a successful event. a. Create a planning committee with a designated chair to serve as the project manager. The designated chair should have the authority to make major decisions for the event. c. The planning committee should convene weekly (in-person is preferable, via phone if the team is distributed) to monitor progress of planning efforts and assign action items as necessary. d. Begin the planning process 6 months before the meeting date. The host country should create a project plan outlining key activities and deadlines such as logistical arrangements, developing the meeting agenda, confirming speakers, invitations, securing funding, etc. e. Schedule 2 - 3 calls with SC members from the region in the early stages of the planning process to seek guidance on the strategic direction and theme of the meeting. f. The host government should contract the services of an events management company if needed. b. Invitations to countries that score less than 50% on the eligibility criteria will be determined on a case-by-case basis through discussions between the host government and the Support Unit. c. For the Global Summit and for High Level events, governments must be invited at the appropriate level. d. The event should be open to all civil society (and other non-government) actors. Inquiries for participation can be made through an online form that as a minimum is available on the OGP website. Additionally, the host country can work with the Support Unit and funders to identify and approach specific invitees. ●Priority 2: Civil society actors active at regional/international level including those from multi-stakeholder initiatives and issue-based coalitions/networks. ●Priority 4: Civil society from non-eligible OGP countries that are pushing for eligibility. f. A save-the-date announcement should be sent 4 - 6 months in advance of the meeting through direct mail and email to ministerial and working level government POCs, CS listserve, OGP website and social media channels, and relevant regional networks. g. Send official invitations at least 3 months before the meeting date to give participants adequate time to secure visas and make necessary travel arrangements. h. Implement an online system for registering delegates that have received an invitation. Also, put in place a manual registration process to accommodate the last minute surge of registrants in the weeks leading up to the meeting and to serve as a backup. i. Ensure there is a process in place for accreditation for members of the media who want to cover the event. j. While securing visas is the responsibility of the attendees, the host government should take visa application timelines into consideration when issuing registration confirmations/ formal invitation letters. k. Host countries are expected to ensure that their consulates and embassies are aware of the event and must expedite visas for event participants accordingly. a. The host government will bear the cost of renting the venue, catering, security, media (e.g. livestreaming), and marketing. The host government should also allocate funding for government speakers at plenary and breakout sessions. b. Governments are responsible for funding their own participation. c. The Support Unit will coordinate funding with governments, multilaterals, and funders for civil society participation. a. Logistical arrangements concerning venue selection, negotiations with hotels for block booking rates, diplomatic protocol, transport, security, visa facilitation, media and streaming facilities, translation services, marketing collateral, etc. are the responsibility of the host government. b. Internet access must be provided throughout the venue. c. The host should provide spare rooms and Internet access for ad-hoc bilateral/ group meetings and exchanges on the margins of the event. a. A two day meeting is required to effectively utilize participants’ time since they will likely be travelling to attend the meeting. b. It is customary for civil society to self-organize a half day civil society event, preferably before the OGP meeting starts. Support from the host government to organize this event will be appreciated but is not obligatory. a. The Support Unit requires sign-off on the final agenda. b. The host government should give government and civil society speakers equal time on allsessions of the agenda,includingtheopeningandclosingplenaries. c. Sessions must exhibit gender, sector, and national/ regional balance. d. The overall theme for the event will be determined by the host country in consultation with the Support Unit. e. The agenda must be developed through an open process, i.e. the host government should issue an open call for ideas on breakout sessions so they are led by civil society, multilateral partners, and other governments from the region. Opening up the agenda design process also frees up the host government from the time-consuming task of sourcing all content for the meeting. i. Conduct talk-show style conversations for plenaries with government and civil society representatives rather than rely on speeches by government officials. ii. Design breakout sessions for maximum audience interaction and learning (e.g. workshops, lightning talks, matchmaking sessions, govt-CS dialogues, data jams, etc. instead of traditional panels). g. Ensure adequate time for continued networking between and during breakout sessions.This could be done using coffee/tea breaks between sessions and designated meeting spaces at the venue. -OGP 101, including basics on the OGP institution and processes, for non-participant countries. 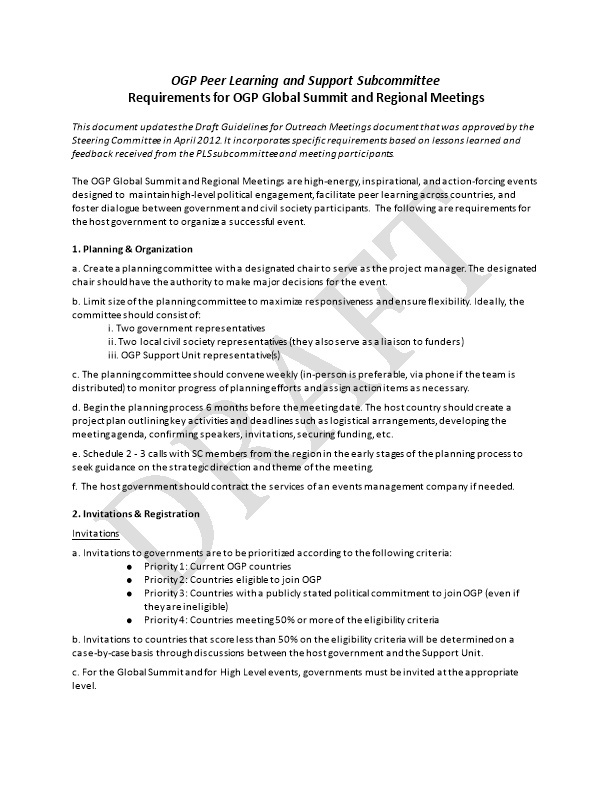 i. Additionally, organizers are required to allocate time on the agenda for OGP Working Group sessions. a. The Support Unit communications liaison will work with the host government on event promotion and media outreach including creating an event webpage on the OGP website, blog posts, press releases, etc. b. The host government should use print, broadcast, and social media before, during, and after the event to maximize visibility. c. Provide ways for remote participation including live streaming, social media outreach, and discussions via Twitter. Sessions should be livestreamed where possible and video recordings of sessions should be accessible on Youtube. d. The host government should create an exclusive hashtag for the event, which will be prominently displayed to all attendees. The hosts should also consider displaying live Tweets on the main stage throughout the event (as done at the 2013 London Summit). a. All participants should be given the opportunity to evaluate the event and provide feedback via an online or paper-based survey.